You want to shop healthy, but that trip to the grocery store can be daunting. With so many choices and misleading advertising, it’s hard to know what to put in your cart. Increasing the "nutrient-dense" foods we eat. Reducing our intake of sodium, and of solid fats and added sugars (now called SoFAS). Nutrient-dense foods are also low in solid fats and have not been diluted with “junk” calories such as added sugars. Shop around the perimeter of the grocery store to find these nutrient-dense foods. Fatty animal products — marbleized steak, full-fat (regular) cheeses and ice cream. Baked goods such as cookies and crackers. Convenience foods that contain hydrogenated fats (liquid vegetable oils put through a chemical process to solidify them). 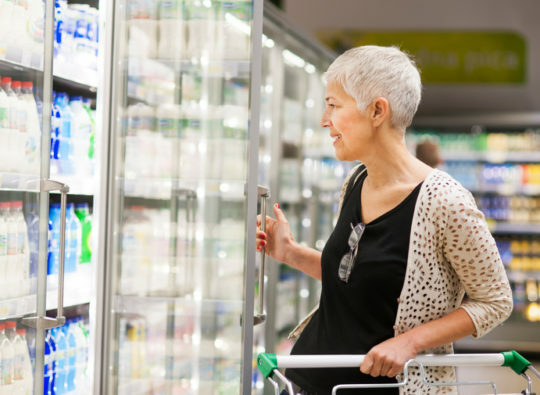 Compare saturated fat and trans fat amounts on the “Nutrition Facts” box on packaged foods and look for hydrogenated fats on the “Ingredients” lists to identify foods with solid fats. Steer clear of foods with added sugars at the top of their ingredients panels. Comparing labels for sodium content can be a real eye-opener. Filling your grocery cart with nutritious foods can be rewarding and fun for your family. With each trip, try comparing a few similar products for SoFAS and sodium content. Before you know it, you’ll have added new favorite foods and brands to your weekly shopping list. For kids, it can be like solving a puzzle. Plus, they’ll take pride of ownership in the foods they choose.